Four Chords and a Gun is a performance that we hear before we see. Fitting, considering it takes us behind the scenes of the iconic punk rock band the Ramones. After a rousing drum solo and some brief narration by sometime band member Marky Ramone (played by James Smith), we get to business. At least as much as a group of angry, self-medicating punks from Queens can. The play is penned by comedian and actor John Ross Bowie, best known from roles on TV shows The Big Bang Theory and Speechless. This may cause trepidation for non-lovers of sitcoms, but untethered of television’s formulaic structure, Bowie proves himself a capable storyteller. He weaves a passionate, sharp, and informative account of the band, focusing on their trials and tribulations around recording the 1980 album End of the Century with flamboyant gun-toting producer Phil Spector. If you put the rapid-fire style of Aaron Sorkin through a meat grinder and soaked it in vodka, you get an idea of Bowie’s script and how the cast delivers it. The organic, self-destructive nature of the band and their sound is in stark contrast to Spector’s harsh, Kubrickian demands for precision. Despite all the chaos on stage, we never miss a word and none of the energy feels wasted. The physicality of the performers deserves special mention, as so much of the communication on stage is without words. Lead singer Joey Ramone’s obsessive-compulsive disorder is conveyed through a touching physical performance by Justin Goodhand. His portrayal of Joey as a gentle giant with a pure love for his art, being taken advantage of by colleagues and loved ones made my heart ache. Production design elements used simple, bold aesthetics with a set (designed by Nick Blais) littered with punk-rock accouterments that transformed from places like Spector’s mansion to Joey’s rundown apartment. Ming Wong’s wardrobe design is textured and authentic, with chunky heels, pressed pantsuits and leather jackets to illustrate the late-’70s setting. Although, my nitpick is that the costumes looked too new and clean on some characters. Other than a few tears and wrinkles, the band members’ outfits didn’t look lived-in enough considering they routinely pass out on floors. There is a dramatic moment involving Joey refusing to remove his boots for over a month, but the boots in question didn’t look as beat up as they logically should have been. You don’t have to know much about the Ramones to enjoy this show, but it helps. Some references to other musicians and the entertainment industry at large were confusingly unexplained. However, they’re generally nagging pieces of trivia that don’t interfere with the overall enjoyment of the show, and maybe they’ll inspire audiences to go home and learn more about the band and their legacy. Important about this show is that the music is performed at the end, instead of throughout. It’s very “punk rock” to avoid the big, cheesy jukebox musical format, but it makes for a bumpy experience, especially with the actors playing the Ramones and the musicians covering the songs being completely different people. The expected behaviour and etiquette for the concert part were also unclear – do people stay seated, or do they get up and enjoy the music the way the Ramones intended? Two enthusiastic audience members chose the latter and were clearly having a blast, but the rest of the room felt uncertain about the rules of engagement. I couldn’t help but notice some patrons fidget and glance at the time on their phones – make of that what you will and what it says about the show, or the audience. Four Chords and a Gun is, like any punk rock show, a fun and engrossing time despite and because of its rough edges. Shows run Tuesday to Sunday with showtimes at 2pm, 7:30pm and 8pm. For more information, see the ticket information page. Photo by Dahlia Katz. 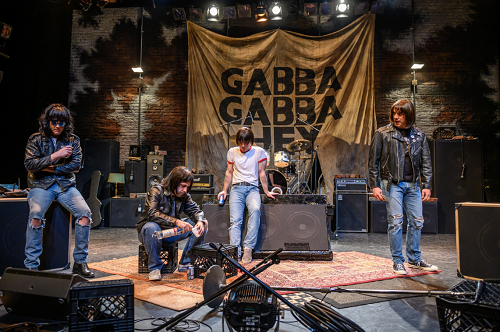 Cast L-R: Justin Goodhand as Joey Ramone, James Smith as Marky Ramone, Paolo Santalucia as Dee Dee Ramone, and Cyrus Lane as Johnny Ramone.